A lot of companies -- including heavyweights like Microsoft -- believe that motion control is the future of the human-machine interface. But it's an awful lot of work to wave your hands around every time you want to change windows, isn't it? 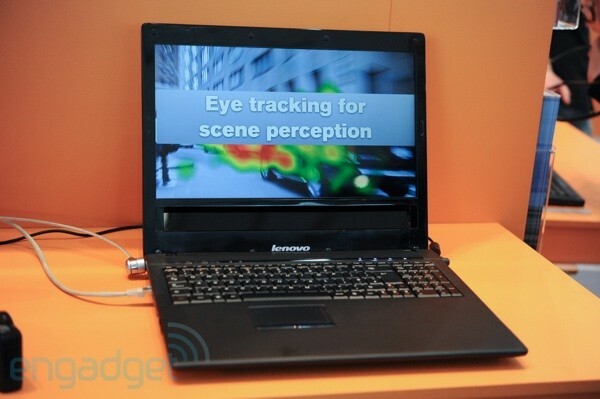 Swedish firm Tobii, which specializes in eye control, teamed up with Lenovo to craft a run of 20 prototype Windows 7 laptops with eye control sensors built-in, and we had a chance to check out the setup here at CeBIT today. The verdict? It works extraordinarily well -- Tobii clearly knows what it's doing, because even with our sloppy calibration at the start of the session, the system still detected where we were looking with pinpoint precision. One demo the company had set up was an Expose-style layout of all open windows, and we were able to target the smallest of the bunch (Calculator in this case) consistently and naturally -- we never felt like we were "staring" to make something happen. Clearly this is a capability that'll require some UX thought and research, because you don't want the computer to just start doing things as you look around; most of the eye-controlled capabilities they'd baked into the laptop here were triggered with a key command, though one feature we really liked -- a quick bar to access frequently-used media -- was pulled up just by looking beyond the left side of the screen. It also worked very well and never came up when we didn't want it to. The level of precision was further verified with a simple game they've created where you blow up asteroids before they impact Earth just by looking at them; the smallest rocks were only a few pixels wide, and we could consistently blast 'em. As for commercialization, they're still a ways off -- they're thinking two years if they can team up with the right partner. Tobii says that there's a trade-off between sensor size and accuracy; the prototype has a sizable hump on the back and a roughly inch-wide strip running directly below the display, both of which are pretty impractical for a truly portable machine. The sensor must be below the display, we're told, though it could be made quite a bit thinner -- no wider than the bezel you've got below your notebook's current display. Follow the break for a full video demo!